As it turns out climbing to the summit of an enormous ice cube is a precarious, nerve-racking experience. The following video (h/t Digg) serves as another chapter in the tome of unusual, exciting and sometimes terrifying actions produced by those strapped with a GoPro camera. 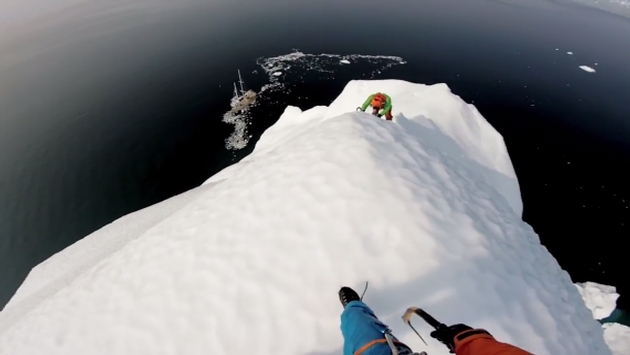 In this installment, ice climbers Klemen Premrl and Aljaz Anderle visit gorgeous Greenland, deciding to summit a perfectly fine iceberg. The video is simply entitled, “GoPro: To Climb An Iceberg in 4K.” While we have no clue what your respective screen resolution might be, we would like to suggest watching this captivating video in full screen. While most will never climb an iceberg, you really get a sense of the grandeur offered by Greenland’s Disko Bay where this was all captured and spliced together for our enjoyment. You also get a firm grasp of how immensely dangerous this kind of work is, because the climbers visit structure after freezing structure before settling on one that wasn’t nearly as treacherous as the others. Still, the one iceberg that is selected for the ultimate climb does offer its own harrowing moments as sheets of ice plummet into the sea at one point. Even the moment a climber looks at his phone on the boat, highlighting a couple of kids back at home, yields an ominous, foreboding feel to the video. In the end, we get something usually offered by our own trips and travails around the globe: a renewed appreciation for this massive world in which we reside. Greenland is undoubtedly breathtaking, but we imagine its best to savor the scenery from the sidelines, where the ground isn’t known to crumble beneath you.